Marvin is Trademark Construction, LLC’s lead carpenter. 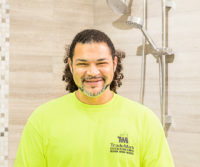 He has a variety of certifications, including cabinetry, tiling, and shower systems installation. He personally works on each project and is a crew leader, ensuring that everything runs smoothly and that the client is only receiving the highest-quality craftsmanship. His attention to detail and ability to solve problems ensures that the client will always be satisfied. Marvin joined Trademark in 2007, and Trademark is proud to have such an exceptional personality on our team. Marvin has an extremely strong work ethic and has created a reputation for customer satisfaction and superior service. He loves taking on new projects and challenges, and will always leave every client with the best impression.